Jones Park Leagues Club < Sports Clubs in Westcourt < Cairns Local - Cairns Local Business Directory for Cairns, Bungalow, Palm Cove, Smithfield, Yorkeys Knob, Manunda, Portsmith, Stratford, Clifton Beach, Kewarra Beach and surrounds. Enjoy a relaxed environment at the Jones Park Leagues Club! 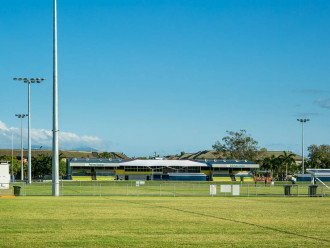 Perfect for a casual lunch, a place to watch the game with mates, a quiet beer or coffee, or simply a dinner get together with friends, the Jones Park Leagues Club is open Fridays, Saturdays and Sundays throughout the year. Sit, eat and drink in the main bar lounge, coffee lounge and bar, function rooms or billiard room…our homestyle, hearty menu has everyone in the family covered, from the youngest fussiest eaters to those who enjoy a hot roast Sunday lunch. Membership is required, but can be easily obtained at the door with a gold coin donation which is passed along to the Junior Players Development Fund - CDJRL which supports upcoming players on their path to higher football. For more information about opening hours, our menu, our friendly hospitality team or membership, check out our website or give us a call today!